During a trip organized by Dr. Fred Sorrells, the President of the International Institute of Sport (IIOS), the Haitian Men’s Amputee National team visited the United States Sports Academy on Tuesday, 14 December. 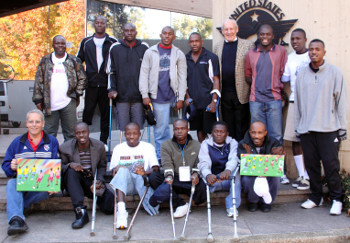 Sorrells helped put Haiti’s amputee soccer team together after an earthquake devastated the country earlier this year. He was seeking a therapeutic way to help the disabled in Haiti when he discovered the Amputee World Cup being held in Argentina. The soccer team gained international recognition when they competed in the Amputee World Cup in October, despite not winning the championship. With only a month of training before the first championship game, the world marveled at their pure athletic ability and sheer determination. The team is now touring America to spread their message — that those who face disabilities are capable of great things, if given the chance.